Preheat oven to 350°F. Prepare the angel food cake batter according to the package directions. Divide cake batter evenly into 6 small bowls. 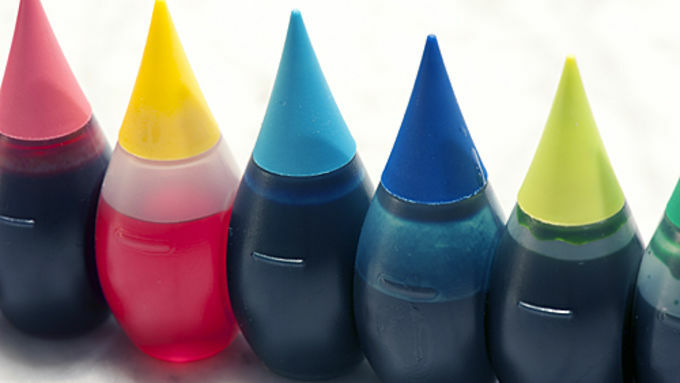 Add three drops of food coloring each to make rainbow colors pink, yellow, green, blue and purple. For orange, use two drops of yellow and one drop of red. Drop the batter by spoonfuls into two standard nonstick 1 lb loaf pans (each pan approximately (9 inches x 5 inches). Bake at 350°F for 33 to 45 minutes, until the cakes are brown on top and have a deep crack. Do not underbake. Cool the cakes by resting each pan on its side on a cooling rack. Let the cake cool completely before proceeding (at least one hour). Cut each cake loaf into slices. Remove the top crust from each slice and discard. Cut the remaining cake pieces into 1 to 1 1/2 inch squares and set aside. Prepare the custard. Pour three cups milk into a medium bowl, Whisk the pudding mix into the milk. Continue to whisk for two minutes. Add one cup whipped topping and stir until fully incorporated. Assemble the trifle in a large glass bowl (or trifle dish), beginning with a layer of cake squares, then custard, fruit, and a layer of whipped topping. Continue layering in this order until all the cake, custard and fruit have been used. Top with remaining whipped topping. Refrigerate trifle for two to three hours before serving. I was excited to try my hand at this Double Rainbow pudding dessert! 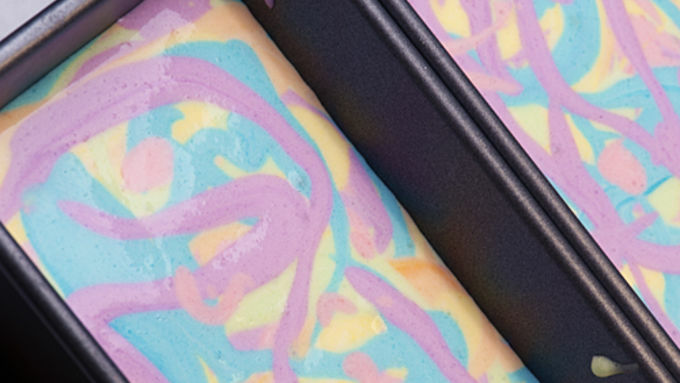 I was determined to squeeze every rainbow I could into this dessert – even if some had to go in sideways. 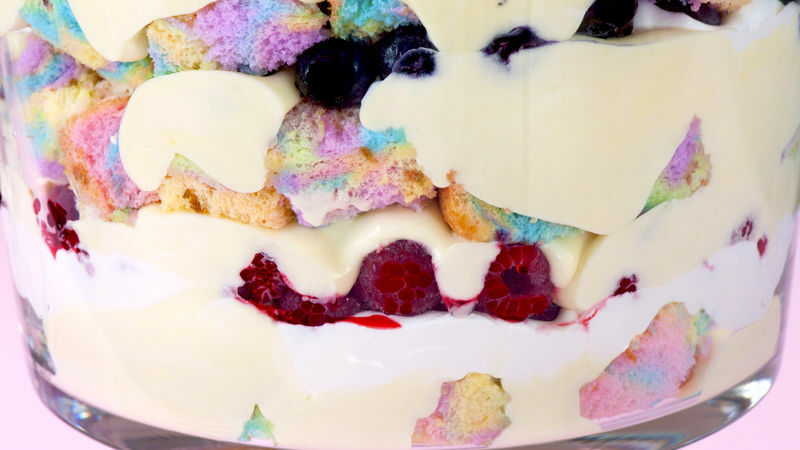 A pudding-filled trifle with rainbow angel food cake was clearly the way to go. As you can see, there are actually a multitude of rainbows in Double Rainbow Trifle: squares of angel food cake, each with its own little rainbow; layers of the rainbow cake squares; and the custard, fruit and cake layers become bands of a larger pastry rainbow. Rainbow, upon rainbow, upon rainbow . . . why, it boggles the mind! The rainbow angel food cake was a breeze – just a matter of dividing the cake batter into small bowls and adding liquid food coloring. Next, make like Jackson Pollock and drizzle the colored batter into the loaf pans. 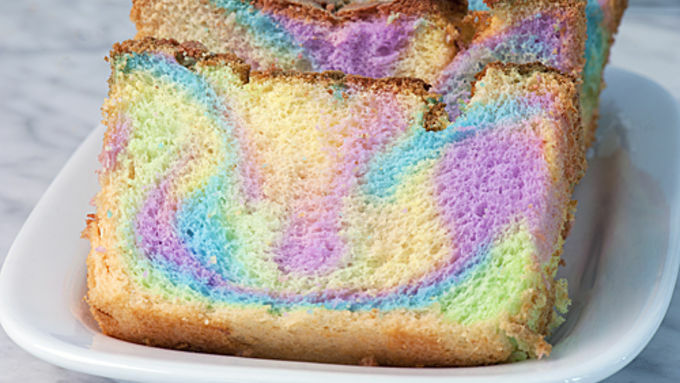 Note to self: trifle aside; this rainbow angel food cake would be a quick, fun dessert to make with kids! Most trifle recipes call for moistening a single, large cake layer with a few tablespoons of liqueur. While you could certainly add some liqueur, my recipe doesn’t include this step because: the cake layers are thinner, and are interspersed throughout the trifle; the pudding is regular consistency, rather than extra thick; and the frozen fruit adds a little moisture as it thaws. I hope you enjoy Double Rainbow Trifle and it meets (or exceeds) your RDA of rainbows!